63,180 lbs of hair clippings, 42,122 lbs of hair colour, 109,512 lbs of foil and colour tubes, and 206, 392 lbs of wastepaper, salon bottles, and other paper and plastic items – that’s the amount of waste being tossed out by hair salons across North America EVERY SINGLE DAY; that’s a whopping total of 421,206 lbs! As a newly Green Circle Certified Salon, we are proud to announce that Level 5 Salon, Inc. is now part of a comprehensive recycling and sustainability program that sets out to significantly reduce our industry’s environmental impact on the planet. From the sourcing of ingredients to the disposal of packaging and products, the salon and beauty industry has long posed many challenges to the environment. With this in mind, we wanted to join forces with Green Circle to take a stand for our planet and work together to reduce our ecological footprint and make our industry more sustainable. Through our partnership with Green Circle Salons, we will be redirecting what was once considered garbage out of our water streams and landfills to be repurposed into innovative green solutions. Starting March 1, 2017, all hair clippings, extensions, any excess colour and developer, papers and, foils, aerosol cans and colour tubes from Level 5 Salon, Inc. will be collected by GCS – effectively cutting down our salon’s total waste, literally overnight, by 85- 95%! As our customers continue to take increasing interest in the ethical and environmental impacts of their purchasing power, we wanted to give our customers a genuinely more responsible, and greener choice when it comes to looking and feeling beautiful. As a member of the GCS network, Level 5 Salon, Inc. empowers our customers with the ability to vote with their dollars for positive change. By supporting our salon, our customers have the peace of mind knowing that they are taking meaningful steps to keeping our communities and environment healthy. 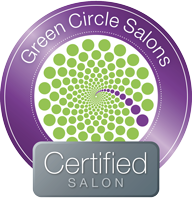 Green Circle Salons is a movement to help the salon industry reduce its environmental footprint and provide options for consumers seeking genuine green options in salon care. Since its inception in 2009, GCS has been building a network of certified salons and providing them with a comprehensive pathway to green solutions including recycling, and the repurposing of hair for the manufacturing of oil spill booms (in partnership with BC Corrections and the Alouette Correctional Centre for Women), emergency bedding (used in Haiti following the 2010 earthquake), and other ongoing sustainable research applications. Today, GCS diverts waste from landfill spaces in every Canadian province and 45 states in the US and has the capacity to service every zip and postal code in North America. GCS works with a growing list of leading green and industry partners including Davines, Kevin Murphy, Goldwell, L’Oreal Professional, Redken, Pureology, Kératase, Matrix, KMS California, Intelligent Nutrients, Neuma and others to come up with innovative green solutions and is committed to giving back 5% of pre-tax profits to local and international organizations to support programs for creative environmental impact and positive change. Find out more at www.greencirclesalons.ca. About Level 5 Salon, Inc.
Level 5 Salon is a modern boutique salon that prides itself on its experienced, exceptional, and passionate hairdressers. We are driven by technical excellence, advanced education, and a client-centered approach to hair. At Level 5 Salon Inc., you can expect professional salon services in an intimate and personal environment. The vibe is casual and effortless, with a touch of humor. Our goal is to bring current trends and techniques to our client’s everyday lives.